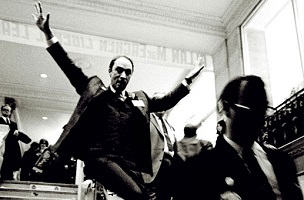 Previewing Thursday and opening Friday at the Leica Gallery (607 Broadway), “Ted Grant: Sixty Years of Legendary Photojournalism” showcases a photographer known for, among other things, a shot of Canadian Prime Minister Pierre Trudeau sliding down a staircase banister at the 1968 Liberal party convention. Twenty-five years after she took his course, Fayle sent a letter to Grant asking for advice on a magazine profile she’d been assigned. Not only did he respond to her letter, he came to her house with his wife Irene. They chatted at her kitchen table for three hours. Without being asked, he accompanied her to the interview, stayed in the background and took some of the most evocative photos she’d ever seen. 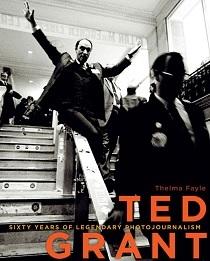 Fayle asked Grant if he’d consider letting her write his biography, interspersed with some of his finest photos. He agreed. It took her almost four years. Fayle’s manuscript was rejected by a dozen publishers before Heritage House Publishing finally came to the rescue and arranged the one-man show here in New York.